2-Bedroom apartment with brand new stainless steel appliances and parking included! Designed to help you feel like home! With the feel of a tight-knit neighborhood, combined with the amenities of an urban and modern environment, you will fall in love! 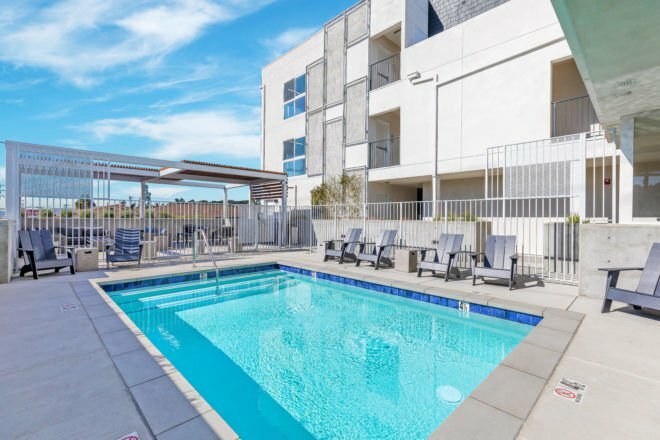 We balance privacy and community with secure parking, keyless entry, a pool and common area lounge, and a view of the famous Eagle Rock hills! You’re steps away from the two main-drag shopping streets that characterize the area. On Colorado Blvd, you’ll find old-school restaurants and delis that have made their name here for decades. York, like a vein running through the heart of Highland Park, is chock-full of fledgling new businesses like coffee shops and specialty food stores, catering to the community’s younger crowd. You’re only 20 minutes from the dynamic urban energy of Downtown Los Angeles, and even fewer from the charming, old-town vibes of Pasadena.